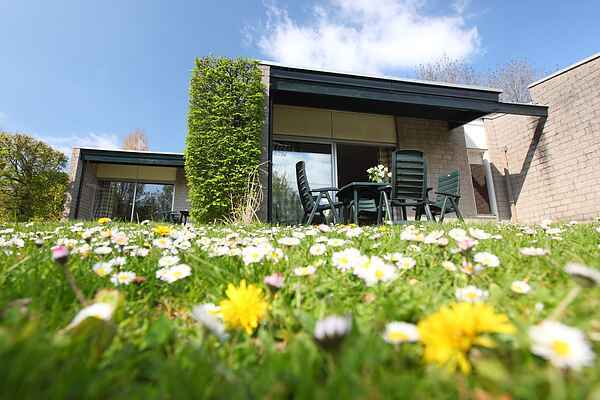 The 4-person link-detached single-storey bungalows at Schin op Geul Bungalow Park are available in four different variants: Standard (NL-6342-04), Comfort (NL-6342-05), Royal (NL-6342-06) and the Royal with sauna variant (NL-6342-07). The Comfort type provides you with everything mentioned under the Standard variant plus a dishwasher, Senseo coffeemaker and box spring beds. The Royal type comes with everything the Comfort type does, plus a modernised living room and bathroom. The Royal with sauna type offers more space than the Royal variant. There is also a separate toilet as well as an infrared sauna. All types include a garden with a terrace and garden furniture. Schin op Geul Bungalow Park is located in a hilly area, which means you might find some relatively steep roads in the park. The park is car-free. On your day of arrival and day of departure you may drive your car in for loading and unloading, though you park your car in the central car park during your stay.